With the fifth beta of iOS 6.1 being released just two days ago, the public version of it has just been released to the masses. You’ll find the changelog and press release below. But, what this really signifies is the potential release of a jailbreak as early as tonight, assuming the jailbreak developers don’t find any issues with it. If you downloaded beta 5 on Saturday and have it installed, then it should be the same exact build, so you don’t need to do anything to get it. CUPERTINO, California—January 28, 2013—Apple® today updated iOS to version 6.1, adding LTE capabilities to 36 additional iPhone® carriers and 23 additional iPad® carriers around the world, so even more iPhone 5, iPad mini and iPad* with Retina® display users can experience ultrafast wireless performance** to browse, download and stream content at blazing fast speeds. To date, iOS users have uploaded over nine billion photos to Photo Stream, sent over 450 billion iMessages and received over four trillion notifications. iOS 6 features include Siri®, which supports more languages, easy access to sports scores, restaurant recommendations and movie listings; Maps with Apple-designed cartography, turn-by-turn navigation and Flyover view; Facebook integration for Contacts and Calendar, with the ability to post directly from Notification Center, Siri and Facebook-enabled apps; Shared Photo Streams via iCloud®; and Passbook®, the simplest way to get all your passes in one place. Additional updates in iOS 6.1 include the ability to use Siri to purchase movie tickets in the US through Fandango, and iTunes Match℠ subscribers can download individual songs to their iOS devices from iCloud. The revolutionary App Store℠ offers more than 800,000 apps to iPhone, iPad and iPod touch® users, with more than 300,000 native iPad apps. App Store customers have downloaded over 40 billion apps, and Apple has paid over seven billion dollars to its incredible developer community. Customers can choose from apps in 23 categories, including newspapers and magazines offered in Newsstand, games, business, news, sports, health & fitness and travel. 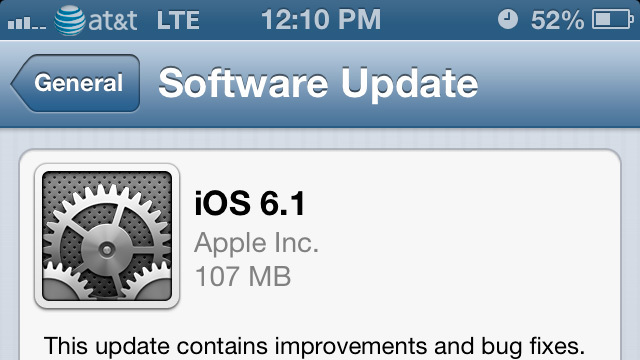 iOS 6.1 is available as a free software update today. iOS 6.1 is compatible with iPhone 5, iPhone 4S, iPhone 4, iPhone 3GS, iPad (third and fourth generation), iPad mini, iPad 2 and iPod touch (fourth and fifth generation). Some features may not be available on all products. For more information please visit www.apple.com. *LTE is available on iPhone 5, iPad mini and fourth generation iPad Wi-Fi + Cellular models through select carriers. Network speeds are dependent on carrier networks, check with your carrier for details. **Information about LTE carriers can be found at www.apple.com/iphone/LTE andwww.apple.com/ipad/LTE. Feel free to follow Brian and Gadget Unit on Twitter.